Until now, if you chose an infrared scouting camera to avoid "flashing" deer, you had to accept compromised image quality. Infrared images were not only black and white, but they were low resolution and improperly exposed. The new Attack IR changes that. Attack IR takes 5 MP images both day and night. The IR images are stunningly clear. 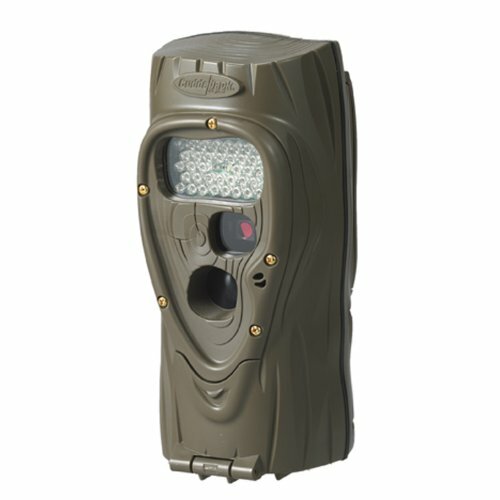 Attack IR uses 36 high-power IR LEDS for a true 60 foot flash range. The Rapid Pulse Technology minimizes IR LED glow by pulsing LEDs for just 1/4 second. Cuddeback's exclusive Adaptive IR Enhancement Technology assures IR images are correctly exposed. The Attack is the result of over three years of design and development and the brain-child of the best and brightest engineers in the U.S. No corners were cut and no idea left unconsidered. The final product is an engineering marvel that you will appreciate every time you use it. Features Full Season Battery Life of 50,000 images. The flash system is 36 Hi Power LEDs. The product of more than three years of design and development, the Cuddeback Attack IR 5-megapixel game camera produces images like you've never seen before. Before the Attack IR, infrared cameras were not only black and white, but also low resolution and improperly exposed. If you wanted to use an infrared camera to avoid "flashing" deer, you had to accept a washed-out, compromised image. The Attack IR, by contrast, takes stunningly clear 5-megapixel game images both day and night. With a variety of high-performance features--including 36 high-power IR LEDs that provide a true 60-foot flash range--the Cuddeback Attack IR is the pinnacle of game cameras. Last updated: April 18, 2019 at 11:20 EST. Pricing information is provided by the listed merchants. GoSale.com is not responsible for the accuracy of pricing information, product information or the images provided. Product prices and availability is subject to change. Any price and availability information displayed on amazon.com or other merchants at the time of purchase will apply to the purchase of the product. As always, be sure to visit the merchant's site to review and verify product information, price, and shipping costs. GoSale.com is not responsible for the content and opinions contained in customer submitted reviews.